We’d love your help. Let us know what’s wrong with this preview of Can I See Your I.D.? by Chris Barton. To ask other readers questions about Can I See Your I.D. ?, please sign up. Be the first to ask a question about Can I See Your I.D.? Really interesting stories, but I could have done without the second person narration. I was disappointed in this. As a kid I loved to read books about "true stories of dramatic escapes", stuff like that. But there are several things about this book that feel off. The second-person "you are there" narration seemed clever and intriguing at first, but by the third or so story, it was wearying. It's one thing to imagine yourself as a teenager running a subway train on a lark, or pretending to be a boy so you can fight for the Union Army; it's something else altogether when you're ask I was disappointed in this. As a kid I loved to read books about "true stories of dramatic escapes", stuff like that. But there are several things about this book that feel off. The second-person "you are there" narration seemed clever and intriguing at first, but by the third or so story, it was wearying. It's one thing to imagine yourself as a teenager running a subway train on a lark, or pretending to be a boy so you can fight for the Union Army; it's something else altogether when you're asked to imagine yourself as a narcissist and criminal pretending to be a doctor and endangering lives. Several of the people here are petty criminals, and they're presented in basically the same tone as the heroes. Not all of the stories were particularly compelling (or written compellingly?). The slice of Frank Abagnale's life that was chosen here was a pretty dull one, considering the slices that could have been chosen--maybe because the author wanted to choose something from his youth, which I can understand, but it still didn't really work for me. 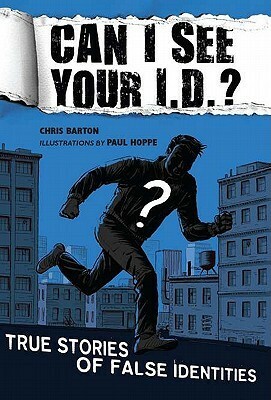 A book I read and liked very much was Can I See Your I.D.? there were 10 different stories and out of them only two were caught and spend time in prison. or with an unfinished story, and retrieves it by making a page about what happened next to the character. Mmmm-no. I felt like I was attending a class with a condescending teacher! As soon as I got this book, I wanted to read more. These true stories are also little mysteries. What people could get away with is amazing. In a couple of stories, the pretending was also an act of heroism. Each story is introduced with a short comic illustrating the opening scene. Paul Hoppe is very good at connecting the illustrations with B As soon as I got this book, I wanted to read more. These true stories are also little mysteries. What people could get away with is amazing. In a couple of stories, the pretending was also an act of heroism. Each story is introduced with a short comic illustrating the opening scene. Paul Hoppe is very good at connecting the illustrations with Barton’s words. The illustrated page would make even reluctant readers want to read all the way through. These stories don’t just end with cliffhangers. The final line makes you wonder what’s going to happen next. Lucky for us, the story goes on a little bit further in an epilogue to each one. I appreciate the epilogues because they give you a little more history and show the effects of the pretending. I’m so glad that my mom brought this home for me. When I saw the book, it looked like it was going to be filled with mysteries. It turned out to be even better than that. The illustrations draw you in and the writing whisks you through a dramatic event. Any kid who likes history but who is bored with whole centuries of the same thing, will love the fakers and the tales that come with them in "Can I See Your ID?" This is A very good book and most people will like it a lot but this personally was not my taste. This book is interesting because it is about a creating a id and pretending to be someone your not. Very good book and I recommend. If you're into history and wars, then this is the book for you. I'm not a lover of nonfiction in general, but the idea of so many identities being stolen intrigued me. Not as memorable as I thought it would be, but they can't all be 5 star ratings! It is rare that I don't finish a book, but I had to put this one down. While I do enjoy the illustrations, the concept lacked depth. It is just a bunch of stories spat into some pages. Sad to say, I was a bit disappointed. If you only had the time to read one chapter of this book then Solomon Perel's would be my suggestion. This book had a good enough mix of new and familiar. Like most of these reviews mention, the second person is really dumb. I didn't enjoy the book, it had maybe 2 out of 10 stories that I enjoyed a small amount, they were educational but all mostly boring. Short read, but some of these stories were great to learn about. Glad I picked up this book. I already knew some of these stories but several were new to me. I think teens would really enjoy these stories. This book brings up some really interesting stories that may or may not be familiar to students. Some of them tie into movies (Princess Caraboo, Catch Me If You Can). It brings up an interesting point - are there any victimless crimes? This would be a great conversation starter or even a good read-aloud for older (middle/high) students. I wanted to get my hands on this book for two reasons. First, Chris Barton wrote it. (Duh.) Second, I’d read somewhere the entire collection of thematically-linked true stories was written in the second person; this I had to read. Those are the opening lines from Barton’s profile of Mary Baker, I wanted to get my hands on this book for two reasons. First, Chris Barton wrote it. (Duh.) Second, I’d read somewhere the entire collection of thematically-linked true stories was written in the second person; this I had to read. Those are the opening lines from Barton’s profile of Mary Baker, who spent a couple crazy weeks in the summer of 1817 impersonating an exotic Asian princess. Her story is interesting in its own right, but because of the Barton’s choice to tell it in the second person, and to bundle it with ten additional short biographies of pretenders, readers are treated to something unexpected: front row seats in her interrogation. The reader is there with me in the meadow, catching butterflies. And if the form has worked the way I intended, she will be breathing quietly, waiting to see what happens next. Can I See You ID is a great book about people who have deceived others by taking on fake identities. Some people in this book have taken on false identities for wealth. Frank W. Abagnale Jr. is a good example of this. He had left home when he was 16 with nothing but a driver's license and a checkbook. By changing his driver's license and tricking banks into giving him money, Frank had made millions by the time he was caught. Others changed for challenge. Keron Thomas was obsessed with trains. He wasn't a kid either. He was 16 and was dreaming to drive a train one day. Then he gets a thought, "Why not live the dream right now?" He then pretended to be Sabio, a subway operator, so he could drive a subway. It all went well, until he broke the speed limit and got caught. Some people have even changed their lives for attention. Mary Baker had showed up at a town and pretended to be a princess, just for a little while for fun. But the attention got to her. She kept up the charade for even longer. She kept it up for as long as she could, until someone exposed her as a fraud soon after. Many other people in this book have changed their identities for many other reasons. But almost all of them got caught. This book was very interesting and seemed like a movie somebody would make up. But all of these stories are real, which just made it even more interesting. This is a collection of ten stories about people pretending to be somebody or something they’re not. Keron Thomas, for example, had such a desire to be a subway motorman that he pretended to be one and actually finagled his way into driving the train in New York City. Wow. Only problem: you’ve never done this before and…well, mistakes will happen. Then there’s high school dropout Ferdinand Waldo Demara Jr. who passes himself off as a navy surgeon. It gets a little sticky when he has to actually tend the injured although he manages to pull the captain’s aching tooth. There’s a Yankee woman pretending to be a man as a soldier during the American Civil War. This ends badly. There’s a white man with dyed skin pretending to be black. (John Howard Griffin who wrote a famous book about it, “Black Like Me.”) The most edgy tale perhaps is that of Solomon Perel, circumcised Polish Jew during World War II who ends up in the Hitler youth trying to stay alive. The stories are all told in the second person (“you” did this, “you” did that) giving the narratives a close-up feel. Short stories have been written in the second person and even some novels. It can seem artificial but for some reason it was natural here probably because Barton’s prose is so easy to read. In fact the book reads like something written for tweeners. There are some excellent gray scale drawings by Paul Hoppe and a Bibliography detailing where Barton got the information for the stories including, I was amused to notice, a 1993 news story for The Washington Post written by Malcolm Gladwell . author of “The Tipping Point,” “Outliers” and other bestselling books. I call books like this “confections” since the stories are like bonbons: you can’t read just one. Can I see Your I.D.? : True Stories of False Identities by Chris Barton is a fascinating anthology of mostly-true stories of famous cases of stolen, mistaken, or hidden identities. Each story is told through a unique second-person narrative style which makes the reader the culprit of each of these actions. Some of the stories are light-hearted and fun, such as the story of a young man who pretended to be a train engineer or a man who pretended to be a pilot. Others are much more dark, such as a young Jewish man who pretended to be in the Hitler Youth to escape execution, or a young woman in the Civil War who died a quiet, sad death. This second-person storytelling, as mentioned before, was at first quite jarring. It seemed to create a sort of cognitive disconnect between the historical events and the story as being told. However, as I read more it began to grow on me, and when I considered this book being placed in a 5-8th grade class, I began to understand it more. I believe this book would be excellent for younger readers, it has an ability to fully engage them and expand their minds by giving them the opportunity to pretend it is they themselves in these bizarre and impossible situations. An adult reading these stories may feel confused, but I feel a young student reading these would be entranced. A neat collection of ten true stories of deception. Some of which I'd heard of before, and a couple new to me. The aspect of this book that struck me the most was the way the author chose to present the stories. Rather than just giving the information, and telling the stories as a narrator, Barton pulls readers into the story; by using "You," in describing the characters and their stories he lets the reader momentarily don a disguise of their own and put themselves into the identity of another. O A neat collection of ten true stories of deception. Some of which I'd heard of before, and a couple new to me. The aspect of this book that struck me the most was the way the author chose to present the stories. Rather than just giving the information, and telling the stories as a narrator, Barton pulls readers into the story; by using "You," in describing the characters and their stories he lets the reader momentarily don a disguise of their own and put themselves into the identity of another. One of the main questions of the book was, "Who are You," which was clever and worked well with the stories he chose. You could be anyone, from a boy obsessed with trains to a couple running to freedom. What is your disguise? At the end of the book the reader even gets to play at being Barton himself. Tells short stories about a series of ten people who convinced the world they were someone else for a time. The author takes great pains to get at the motivations of the protagonists in these stories. He tells the stories in second person ("You are a fibber."). This makes the reader get into the characters heads in a more direct way than most nonfiction. I was anticipating this form to become annoying, but it didn't really. Only in the afterword, where the author writes second person about himse Tells short stories about a series of ten people who convinced the world they were someone else for a time. The author takes great pains to get at the motivations of the protagonists in these stories. He tells the stories in second person ("You are a fibber."). This makes the reader get into the characters heads in a more direct way than most nonfiction. I was anticipating this form to become annoying, but it didn't really. Only in the afterword, where the author writes second person about himself. That got over the top. But for most of it, it gives things a sense of immediacy. Can I See Your I.D.? is a collection of 10 short biographies of real people who assumed a false identity for one reason or another. The stories span from the civil war to modern times. The reasons for their duplicity vary widely, some are born con artists while others are merely trying to survive. Some of the stories are quite astonishing. This is perhaps a good recommendation for a reluctant reader or as a read aloud in class. The stories are only a few pages each and read very quickly. It migh Can I See Your I.D.? is a collection of 10 short biographies of real people who assumed a false identity for one reason or another. The stories span from the civil war to modern times. The reasons for their duplicity vary widely, some are born con artists while others are merely trying to survive. Some of the stories are quite astonishing. Can I See Your I.D.? is a fun collection of true crime stories about 10 people who assumed false identities mostly in order to commit some kind of crime. Each story ends with a "What happened next?" to tell the rest of the story and there is a bibliography at the end of the book. The stories are brief which makes for an easy read. Overall I enjoyed the stories and I think boys (especially reluctant readers) would like it as well. I’m the author of picture books including bestseller Shark Vs. Train, Sibert Honor-winning The Day-Glo Brothers, and Whoosh! : Lonnie Johnson’s Super-Soaking Stream of Inventions, winner of the Beehive, Blue Crab, and Towner Awards and included on 15 other state reading lists. My newest books include Dazzle Ships: World War I and the Art of Confusion, Book or Bell?, the Mighty Truck early-reader se I’m the author of picture books including bestseller Shark Vs. Train, Sibert Honor-winning The Day-Glo Brothers, and Whoosh! : Lonnie Johnson’s Super-Soaking Stream of Inventions, winner of the Beehive, Blue Crab, and Towner Awards and included on 15 other state reading lists. My newest books include Dazzle Ships: World War I and the Art of Confusion, Book or Bell?, the Mighty Truck early-reader series, and What Do You Do with a Voice Like That? The Story of Extraordinary Congresswoman Barbara Jordan. I visit schools by the score and also love speaking to professional gatherings of librarians, educators, and fellow writers.